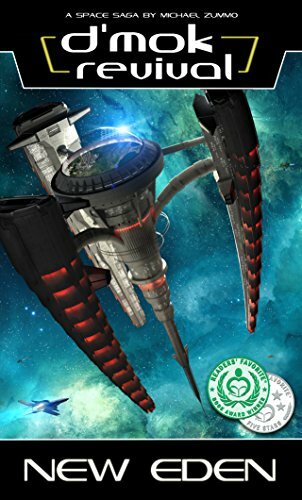 Following up on the Nukari Invasion Trilogy, “D’mok Revival: New Eden” by Michael Zummo, picks up when D’mok warrior leader Rhysus Mencari discovers that his wife and son are being held as prisoners of war by the Nukari. He had believed that they were dead. Even though the Nukari invasion has ended, there are factions of Nukari warriors and their allies still stirring up trouble in the universe. Their ruthless leader Kajlit’ga has managed to manipulate some alien races into helping in her battle against the D’mok. This battle becomes very personal to Rhysus, because much of her actions have a direct impact on him, especially the imprisonment of his family. Rhysus takes his team of warriors to New Eden where they use it as a home base while trying to clean up what is left of the enemy. He endangers them by taking them off on side missions where he secretly searches for his wife and son. In time, the truth comes out and there are some very surprising revelations. Kajlit’ga’s influence has truly had a devastating impact on his family. Determined to get them back together as a whole family again, Rhysus stretches his abilities beyond anything he could have imagined. He is determined to defeat the Nukari and lead a normal life. But at what cost? The D’mok adventures are all filled with aliens with unusual looks and talents, vivid settings in space or on different worlds and characters that experience a great deal of growth as they strategize and fight to defeat their deadly enemy. In “D’mok Revival: New Eden,” once again author Michael Zummo has created an incredible science fiction adventure which is difficult to put down. While this is a continuation of a series, readers do not need to start from the beginning to be able to understand what is going on. However, I promise you that you will want to read all of them once you get started!